Xiaomi has launched a lot of phones this year in almost every price segment like super cheap, budget, mid-range and high-end. The Xiaomi Redmi Note 4 was one of the best selling budget smartphone of this year, and in India, it is the top selling phone right now. The company is preparing to launch the successor of the Redmi Note 4, and we have seen a few leaks related to the Redmi Note 5. 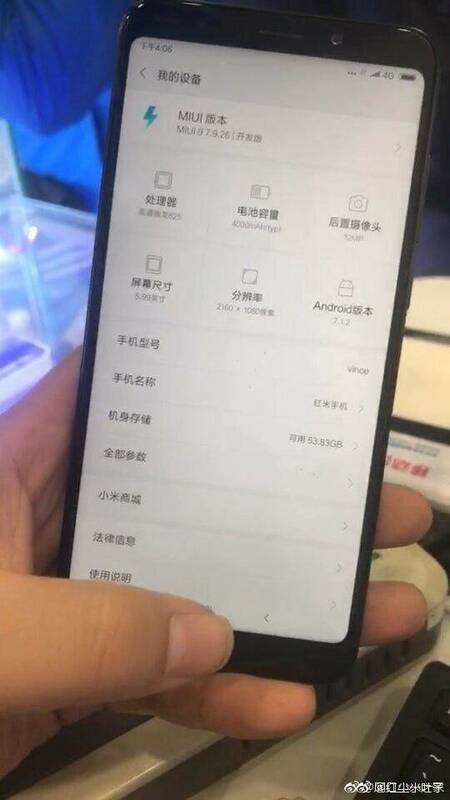 Today, we have got the alleged hands-on image of the phone that may or may not be legit, but it revealed the key highlight of the phone – the display. Also, the ‘About Phone’ screen shows the major specifications like the Processor, Camera, battery etc. So, as you can see in the image above, the phone has that tall 18:9 aspect ratio that we have seen in a lot of phones this year and it is probably going to be the ideal aspect ratio for every phone next year. There are no more capacitive touch buttons, and the phone features on-screen navigation buttons. The corners of the display are rounded.Talking about the specifications mentioned on the screen, the phone has Snapdragon 625 processor, 4,000mAh battery, 12MP rear camera, Android 7.1.2 Nougat and a 5.99-inch Full-HD+ display with a resolution of 2160×1080. The handset shown in the image above has 64GB of internal storage. Now, some things make this leak not 100% legit. First of all, the Snapdragon 625 processor is now More than a year old, and we are surely not expecting Xiaomi to use Snapdragon 625 again for the Redmi Note 5. Next, looking at all the smartphone manufacturers like Huawei, Lenovo, Motorola etc. launching dual camera phones in affordable price segment, it is weird to see that the image above shows the 12MP rear camera. Well, take this leak with a pinch of salt as this could be fake. Stay Tuned for more information.